Mediterranean Cooking with Clifford A. Wright: Is Polenta the Same Thing as Grits? No. Grits is made from ground hominy with the germ removed (germ is the embryo with the scutellum of a cereal grain that is separated from the starchy endosperm during milling). Hominy is made by soaking corn kernals in a caustic solution (lye) that removes the hull. 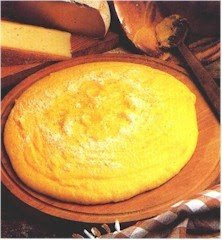 Polenta can be made from a variety of grains such sorghum, wheat, or millet, but typically refers to that made from cornmeal, "meal" meaning coarsely ground grain. Either way, I love polenta and I don't love grits (we were force-fed grits at Girl Scout camp). Polenta with a deep, rich mushroom sauce or a tangy gorgonzola sauce is heaven! Indeed, that's a wonderful dish with gorgonzola sauce; most memorable. My own personal favorite is soft polenta with mild Italian sausages cooked in a rich tomato ragout with lots of Parmigiano-Reggiano cheese. Nice to see this cleared up. I've seen many a bag of coarse cornmeal labeled "grits" and this has been confusing. I love both, actually!